This is a McCall apron pattern from 1940. Such a cute rick-rack planter pocket! I have this pattern and hope to make it up sometime in the near future. This is also a McCall pattern, this time from 1941. I really like the way the apron folds up to look like a necktie. I see this pattern all the time and EvaDress also has a reproduction of this pattern. I've been seeing loads of really neat large flower petal design aprons from 1950's on ebay. The one above is from the Pattern Peddler. I would love to make one of these aprons one day! 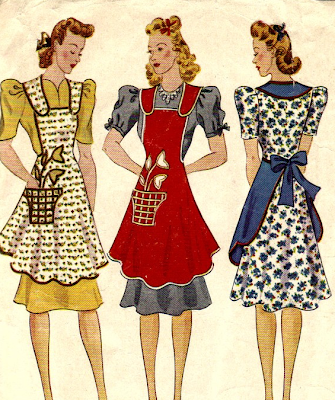 This pattern is from 1947 and like the ones above has a neat design and features an applique as well as heart shapes in the pattern. This is also from the pattern peddler but from their etsy shop. I'm going to forgo the embroidery (though I would love to make one up with embroidery at some point in the future). Which leads me to a question for all of you. How do you preserve iron-on embroidery sheets? Can you use them more than once? Do you transfer them to something else? Thoughts on this would be great! I keep mine in a file with those transparent pockets you get in office supplies, because most of them are usable a few times. When you press them with the iron the longer the iron stays on the darker the transfer is, if you get the knack of not keeping it on too much the ink will last much longer for more applications. If the ink wears off too much to transfer you can just go over it again with an iron on transfer pen. 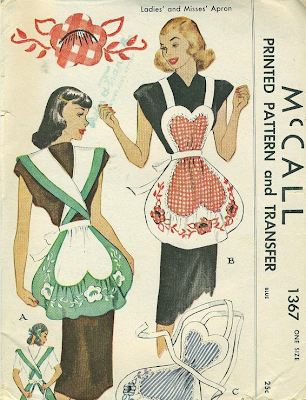 Love the 1947 apron, such a cute shape! Plus, it is a fun blog to read! personally, i make a photocopy of the design and then use embroidery tracing paper to trace it onto my fabric. i've seen the transfer pencils, but i've personally never used them. Oh my goodness, I LOVE those! I don't anything about the transfers, but I think the red polka dot fabric with your pattern will look very cute! Love the aprons. 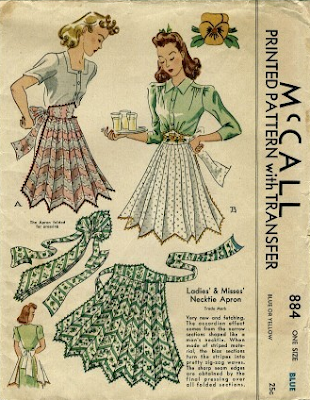 I have a 1950s pattern that I've been meaning to make up. I haven't done embroidery for years, so I don't have advice on that - but definitely interested in what others have posted, since one of my 1940s slip patterns came with an embroidery transfer. there is printer paper which when printed...become transfer sheets themselves...if you scanned the print then printed it out with those sheets...you could use them again...just print it out again.